This can be a bit tricky but cool when it works. First of all you need to set up another blog or wiki that allows file hosting. Again I suggest you keep the username and passowrd the same to keep it simple. Make a post and upload the file you want. 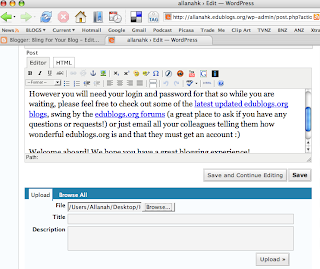 Once uploaded click on it to open the web page it is on and link that to your blog. Click on the link above to see how the download will look. It is a good idea to make your file that everyone can read like a pdf or if that is too tricky maybe a WORD document that most computers can see.